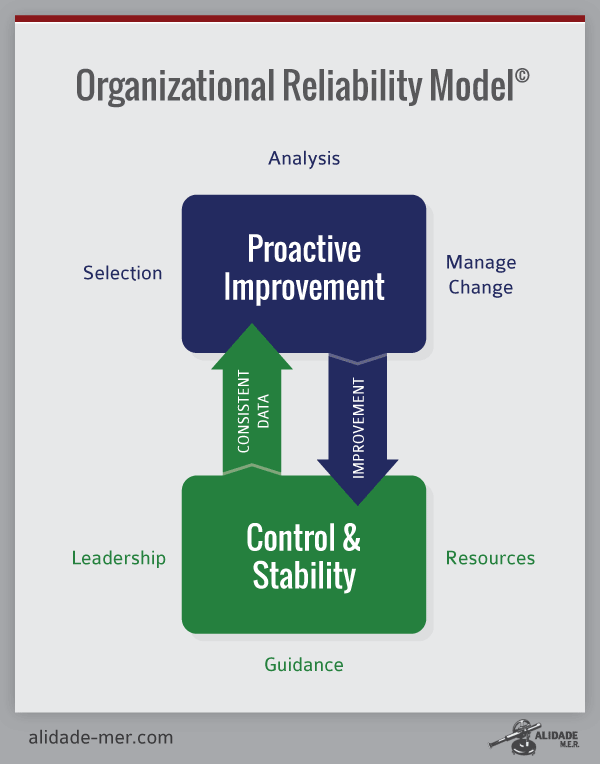 Maintenance Management - The Organizational Reliability Model is an asset management system. Experience shows that simple models work best because they can be communicated more easily, and because they can be applied to a wide range of organizations. Alidade MER has developed the Organizational Reliability Model©. The model is based on the simple concept that control and stability of day-to-day activities creates consistency. Consistent performance generates consistent data. Consistency results in efficiency and effectiveness, and enables proactive improvement. Assets (Resources) – the elements that enable performance; personnel, budget, tools, equipment, technical data, etc. Guidance – the policies, processes, procedures and measures that provide information on how to perform. Execution (Leadership) – the ability of leaders to deploy assets in accordance with guidance to drive effectiveness and efficiency. Proactive Improvement is using asset management principles to assess, define and implement new assets, or to improve existing assets or guidance. It makes use of the consistent data generated by having control and stability. Assess (Selection) – consideration of new requirements or improvement opportunities, evaluating the business case and deciding to go forward or not. This can include risk analysis, criticality, economic analysis, etc. Define (Analysis) – applying engineering and management tools and methods to create the design or define improvements. This includes preliminary and final designs, or application of Root Cause Analysis (RCA), Reliability Centered Maintenance (RCM), LEAN, Six Sigma, etc. Implement (Manage Change) – taking the solution identified in the Define phase and obtaining the assets, modifying guidance and training/enabling personnel to deploy the change. The output of the Proactive Improvement cycle is an approved, properly designed and fully deployed asset or change that is fed back into the Control & Stability realm. Alidade MER has developed the Guidance & Execution Model© that is used to define guidance and measures. This creates the framework needed for leaders to apply Productive Leadership©. Training, facilitation and coaching for Control & Stability elements. Training, facilitation and coaching for Proactive Improvement elements.